You may be familiar with the iconic Hofner Violin bass made famous by the Beatles and Sir Paul McCartney however Hofner has a great lineup of other guitars and basses as well. We offer German instruments as well as the Hofner CT series of Asian guitars and basses. German instruments offer unsurpassed quality and tone. They feature hand crafted quality and they're a pleasure to play. The CT series offers German the same staple pickups german instruments offer however they are built in Hofner approved Asian factories and have a significantly lower cost. Our most popular guitar is the Verythin. Like the name implies it's quite thin, very playable and has killer tone. It's available in several models including single cut, double cut, Bigsby and deluxe versions. As far as basses go the most popular bass is the V-62 reissue. This is modeled after Paul McCartney's current bass. They also offer a Very thin bass, the President bass made famous by Stuart Sutcliffe and German and Asian version of the cavern bass. Browse this site, if you see a guitar or bass you like and need more information please don't hesitate to contact us. 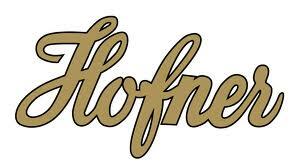 We ship Hofner world wide!